Thandai(ठंडाई) as the name suggests this traditional Indian the drink is prepared & consumed to keep your body cool & healthy during summers. 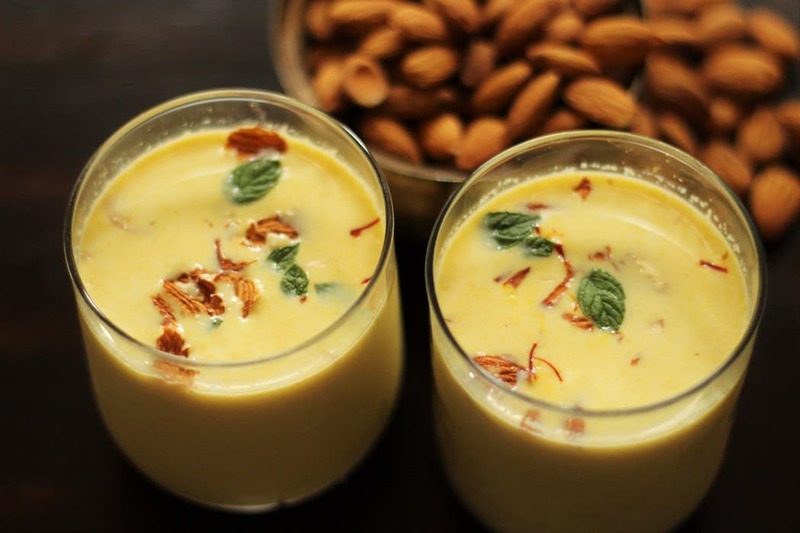 Thandai is a refreshing milk based Healthy Indian beverage consumed during Dry & Hot season. During dry summer winds, Thandai makes you feel cooler and have many other health benefits as well. It also serves an instant energizer in the scorching summer heat. The ingredients present in Thandai have several health benefits. 1. Fennel seeds possess volatile oils which are known for its antioxidants, anti-flatulence, cooling properties. 2. Peppercorn is considered as the king of spices, it has medicinal properties as it has piperine in it. It is also loaded with many minerals like manganese, zinc, calcium, iron and vitamin A. 3. Watermelon seeds are one of the best sources of energy, protein, and iron. 4. Rose petals are very good for digestion problems and menstrual irregularities. 5. Almonds are loaded with healthy fats. It is also a rich source of vitamin E and is known for their antioxidant effects. 6. Poppy seeds they contain iron, phosphorus, and fiber. They also contain thiamine and riboflavin as well as B vitamins. The presence of linoleic acid in poppy seeds protects the body from heart attacks and other heart disorders. 7. Pumpkin seeds are high in Omega 3 fatty acid and the heart-healing mineral-magnesium, which is also Nature’s natural relaxant. 8. Saffron-the active components in saffron have many therapeutic applications in many traditional medicines as antiseptic, antidepressant, anti-oxidant, digestive, anti-convulsant. oxidant properties, phosphorous and protein which is essential for the body. Almonds have good cholesterol and Vitamin E which is essential for skin and hair. 10. Aids digestion- Spices like fennel, pepper, cardamom are known for their special digestive properties which aid digestion and improves bowel movement, thus detoxifying the body naturally and cleansing the blood. 11. Saffron- It is known as the golden spice that prevents arthritis, cancer and improves vision. It is also known to enhance the complexion and prevent indigestion, flatulence, baldness and treat blood pressure. 12. Milk- The highest source of calcium and protein is present in milk. It not only acts as a natural coolant but also strengthens the bones and teeth. Milk also helps in the growth of stronger muscles. 13. Melon seeds- These seeds contain protein, Vitamin A, B, and E which are essential for the heart, bones, and hair. They also contain beta-carotene which reduces depression, headache tension and cools the body. It also boosts fertility in both male and females. 14. Rose petals- The soft and tender petals are an excellent detoxifying ingredient. It can cure diarrhea, irregular periods, cleanse the kidneys and clean the digestive tract. It is also an excellent remedy for the throat infection and running nose. The petals also provide relief from insomnia and nervous weakness. The health benefits of Thandai are limitless, it also has all nutrients like iron, manganese, phosphorous, protein, carbohydrate, fats, and vitamins in the right proportion required for a healthy body and mind. Drink a glass of Thandai every day during Dry & Warm season to keep yourself cool & energetic during summers. Avoid adding too much of sugar in your Thandai to make it a perfect drink. Please like, share & comment on the above post. Do you have any questions regarding Healthy Diet & Food please get in touch with me.